Here we have another Windows 7-powered tablet from Japan: NEC announced [JP] it yesterday, and it’s called the VersaPro Type VT. Details are scarce at this point, but NEC does say its tablet will sport a 10.1-inch LCD screen with 1,280×800 resolution. The VersaPro Type VT will run on Windows 7 Pro 32bit, with NEC promising a “high level of security”, just like on conventional Windows PCs (obviously, the device is primarily aimed at businesses, as are many of the other Windows tablets). It will have an Intel Z670 CPU (1.50 GHz), 64GB SSD, DDR2-SDRAM 2GB, IEEE802.11 b/g/n Wi-Fi, Bluetooth, and a replaceable battery. 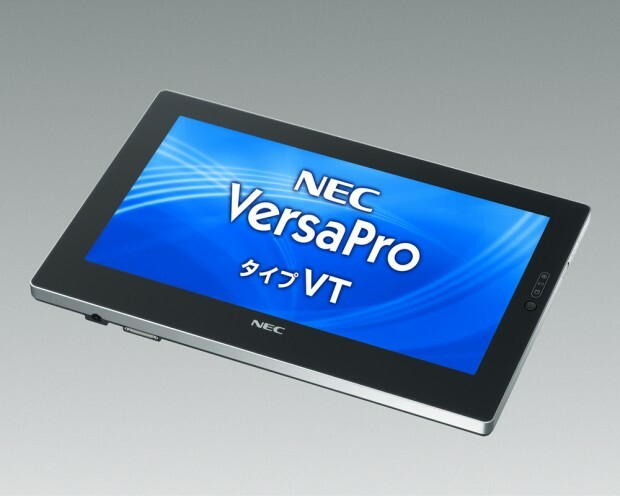 NEC plans to start selling the VersaPro Type VT in Japan in September (price not yet fixed). The picture doesn’t necessarily show the final design by the way.